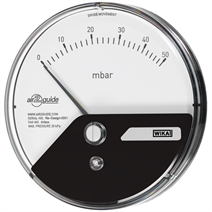 The model A2G-05 Eco differential pressure gauge is used for monitoring the differential pressure in ventilation and air-conditioning applications. The measuring ranges cover from 0 … 50 Pa to 0 … 12,500 Pa. Plus/minus ranges can be fulfilled from -25 … +25 Pa to -1,500 … +1,500 Pa.
mounting ring), the A2G-05 can be exceptionally easily and quickly mounted. In a special version, the A2G-05 is available as a silicone-free product.